The Martin Las Vegas high rise condos gets a redesign as new units and models attract investors and buyers. Formerly called Panorama North, The Martin is expected to sell out as did the neighboring property Panorama Towers to the south. 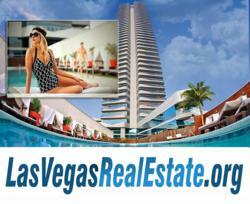 In the last 6-months 43 re-sale high rise condos sold in Panorama Towers according to LasVegasRealEstate.org. These sales signal that demand for Las Vegas Strip view condos is in demand and will carry over to The Martin starting at just $200K. According to Ashley McCormick of Realty One, Neveda's number one Las Vegas real estate company, The Martin condos for sale offers a very unique view from the "10" units that have 180 degree unobsructed Las Vegas skyline. McCorkick who specializes in Las Vegas high rise condos for sale notes that each of the 374 one and two-bedroom layouts capture dramatic views, however the "10" units are some the most dominating views available for ownership and advises buyers to not hestitate and grab one of those units before they are gone and prices go up. The Martin is one of the only high rise condos for sale in Las Vegas offering financing for buyers that are not in a position to pay all-cash. These luxury condos range in price from $200K to more than $1.5 million depending size, location and amenities. The interiors come with designer appliances, chic materials, warm woods and natural stones. The Effortless Ownership Program offers concierge, valet and round-the-clock white-glove service for those looking for a more affluent lifestyle. The top 2 floors have been set aside for Las Vegas penthouses which may be among the most impressive city views in the world and range from $1.3 to $7 million.